This development began after the famous speech by historian Frederick Jackson Turner in which he announced that the “frontier” in the West had closed as of the 1890 census, bringing the era of exploration to an end. A wave of adventurous female artists proved Turner wrong. Many found in the West an unprecedented opportunity for creative expression. However, none but Georgia O’Keeffe achieved a stature comparable to that of, say, Charles M. Russell and Frederic Remington. 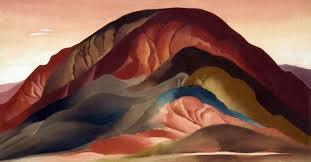 And it was in New Mexico where O’Keeffe found a natural world that would inspire her as never before. Many women who gravitated to the West were well-to-do and had studied under masters in Europe because it had become acceptable to travel without a chaperone. In New Mexico, they found not only a healthy environment but the latitude to set off in pants and on horseback on camping/painting trips to capture spectacular vistas and visit Pueblos. They also found support in each other, which is not always the case. (We are occasionally our own worst enemies.) A paragon (sometimes) of this function was Mabel Dodge Luhan. 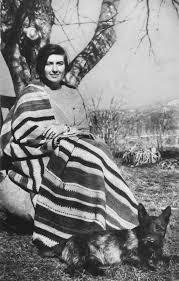 A wealthy patron of the arts and an immigrant from New York, she established a kind of “new Eden” for artists and writers in Taos. It was she who brought O’Keeffe there. 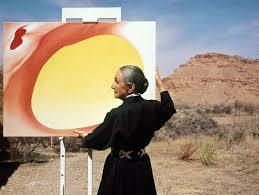 The artistic achievements of the women who found an outdoor studio in New Mexico were stunning. It was freedom as well as a spectacular setting that enabled them to flourish, but in both O’Keeffe and another artist, Mary Greene Blumenschein, we get a good picture of the context. This was not in the book, but O’Keeffe had a complicated relationship with her husband, Alfred Stieglitz, a photographer and gallery-owner in New York who was twenty years older. He very effectively promoted her but was also domineering and unfaithful. Their taxing relationship caused her to be hospitalized first for the treatment of depression and later a nervous breakdown. From the time Mabel commandeered her in 1929, O’Keeffe moved back and forth between New York and New Mexico until Stieglitz died in 1946, setting her free to make this her home. In the case of Mary Greene Blumenschein, she had been extremely successful in Paris, only the second woman to win the gold medal at the Paris Salon d’Automne in 1902. Her husband was a wonderful artist but also a “dominating chauvinist,” as a biographer noted. He “wanted a wife to be housewife, mother, and caretaker of the family home while he went around the country painting.” Discouraged from painting, Mary turned to the making of jewelry. Female artists of New Mexico not only cultivated their own gifts but also worked to promote Hispanic and Pueblo art. 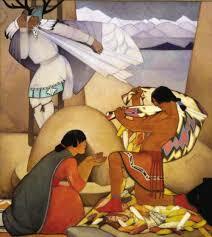 They founded arts societies, the Native Market, and crafts schools. Through them, female artists of the Pueblos like Tonita Peña, who became the first Pueblo woman painter, found collectors as well as encouragement. 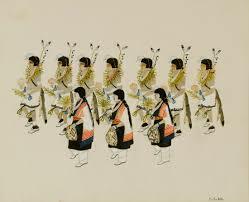 Their art would become an enduring source of income as the allure of the beautiful landscape and Pueblo culture began to make the region a major tourist attraction. This history is especially pertinent in the moment, when the feminine seems to be preparing for yet another giant leap beyond lingering constraints. After all, it won’t be until 2020 that we will be able to celebrate the one-hundred-year anniversary of the right to vote–and possibly the opportunity to lead this country. I’m sure that some men occasionally respond to things like the Congressional white suits honoring the suffragette movement yesterday with puzzlement. But in the flourishing of feminine art in the West beginning in the 20th century, we got in touch with only one way in which civilization has endured in deficit. There is no doubt New Mexico has unbelievable landscapes, awesome historic sites and beautiful cultures. Your article tied that interestingly and factually to some very talented women. One thing I felt I had in common with them is that life is hard with more valleys than peaks. What I find is striking though is that these women were individuals. There was no group think as the white clothed women demonstrated last night. Will any break out and be an individual—we shall see. Ellen, as always love your writing and style. Maggie, you’re one of those women who set the bar. Hope you are well and doing well. What a wonderful commentary on very successful women. I enjoyed watching the white-clothed women in congress last night in the State of the Union speech. Kinda reminded me of an old cigarette ad by Virginia Slims. :-)) Hope to see you in early June.